Further to my Attractive Drabness post I got thinking about the beauty of an "old rugged cross". Just rough-hewn boards! But...they bore the body of the beloved Son of God, Jesus, as He bore the weight and punishment for all my sin. Drab, rough & grey yet attractive...or, as the hymn writer penned, "has a wondrous attraction for me." "The Old Rugged Cross," one of the world's best loved hymns, was composed in Albion, Michigan in 1912 by the Reverend George Bennard (1873-1958). The son of an Ohio coal miner, Bennard was a lifelong servant of God, chiefly in the Methodist ministry. He wrote the words and music of over three hundred other hymns. 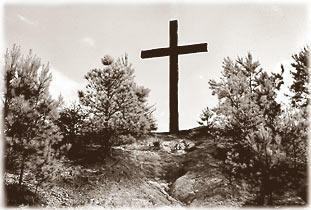 None achieved the fame of "The Old Rugged Cross," the moving summation of his faith.